€ 47,95 € 41,95 Inkl. MwSt. When diagnosed with diabetes, patients work closely with their physician, diabetic educator and pharmacist on how to best take care of their health with an important emphasis on legs and feet. People with diabetes often have circulation problems that can cause peripheral edema (swelling) in their feet, ankles and legs. There are many causes of peripheral edema, not necessarily related to diabetes, such as standing or sitting for long periods of time, physical inactivity, chronic venous disease, lymphedema, heredity, pregnancy, surgery and trauma and some illnesses. Peripheral edema can also be associated with diabetes complications such as heart disease, venous insufficiency, and kidney disease. Certain diabetes medications can also cause edema. 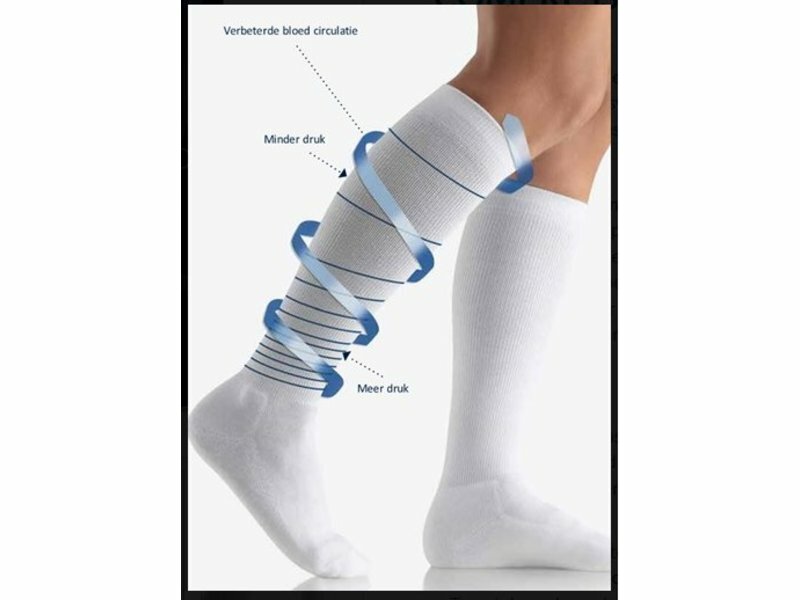 New research (1) shows that for many diabetic patients who suffer from edema, compression socks can help keeping legs and feet healthy, and allow the patient to have a more active lifestyle. 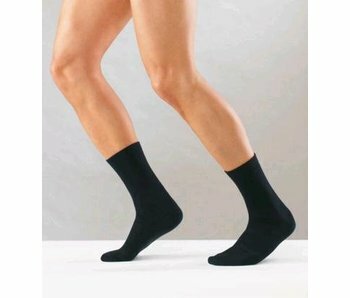 Graduated compression socks and hosiery have been proven to effectively promote venous blood flow by providing a gentle graduated support to leg veins and valves. A calf-length compression stocking goes over the calf muscle to be most effective. 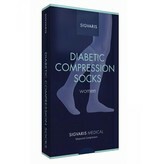 Graduated compression socks and hosiery come in different levels of compression. 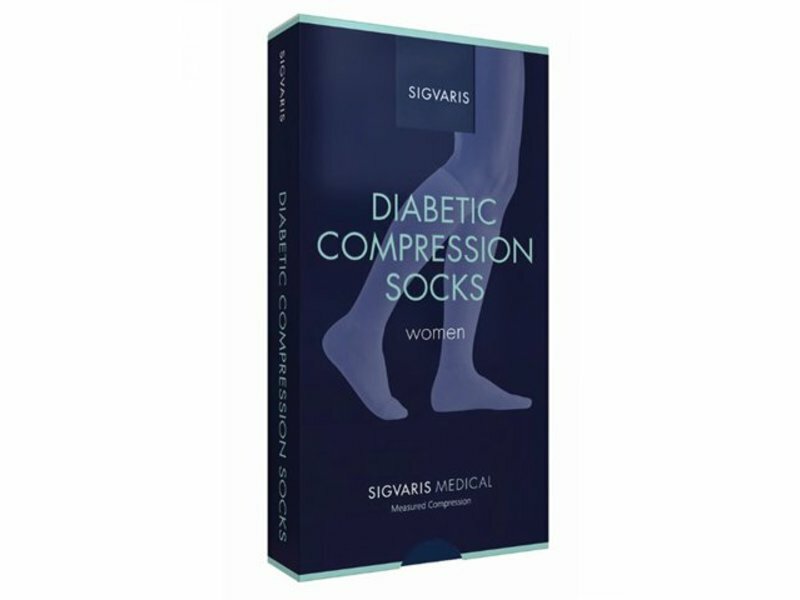 Features of the SIGVARIS Diabetic compression sock include padding sole, flat seam, non-constricting top band, yarn that breathes and wicks away moisture. Sock and hosiery and should be worn under the direction of a physician. 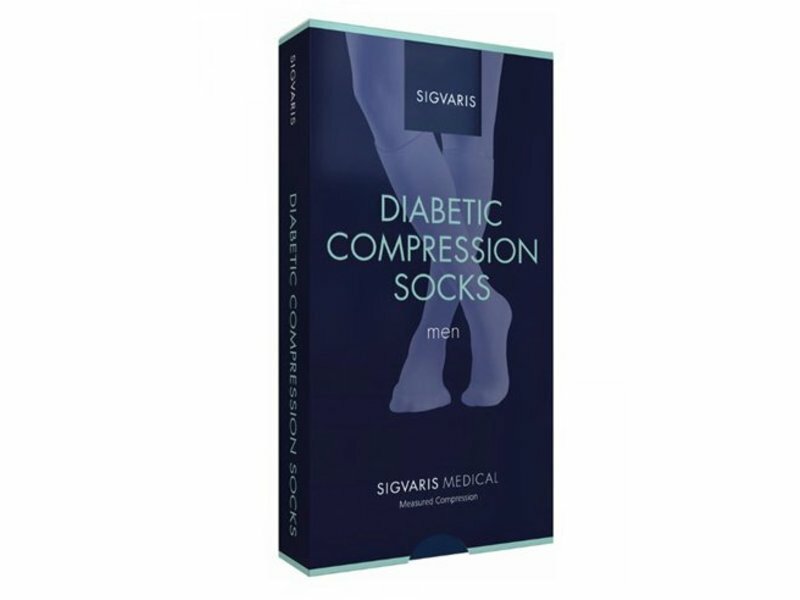 A mild level (up to 25 mmHg) of graduated compression will help reduce the symptoms of swelling, tired and achy legs, spider and varicose veins and other leg discomforts. 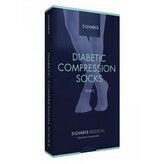 Higher levels of compression are a noted caution or contraindication for a diabetic patient (2). Your doctor can help to determine the correct amount of compression to help reduce the swelling in your legs. Contraindications: peripheral artery occlusive disease (PAOD), diabetic foot ulceration. (1) Wu Stephanie, et al. Control of lower extremity oedema in persons with diabetes with mild compression socks: a pilot study, 2011. (2) Stemmer Robert. Strategies of treatment by compression and mobilisation. Switzerland: Ganzoni & Cie, 1995. 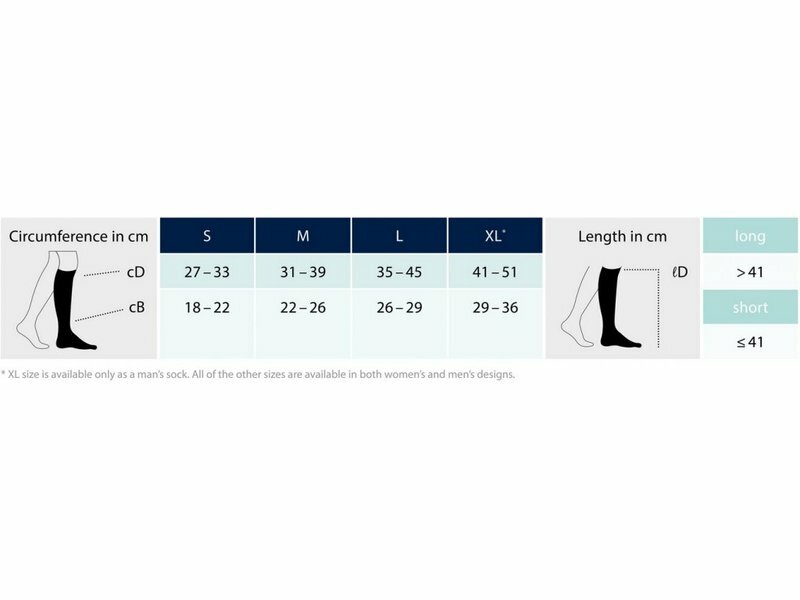 With so much emphasis placed on proper diabetic footwear, it is important that diabetic socks have the correct size, fit, fiber and construction. 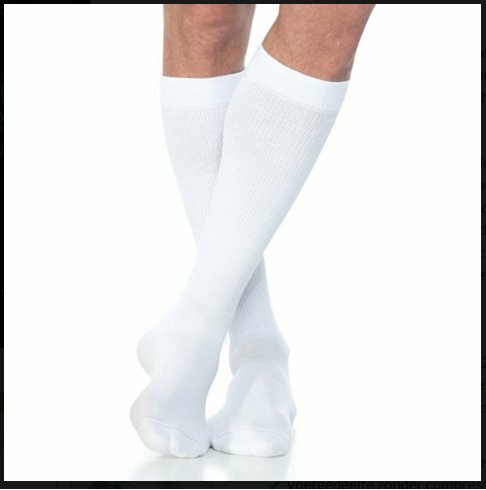 Most diabetic socks are soft, provide padding on the sole of the foot, and should adapt to the foot/leg without wrinkles. They may be seamless or have a "flat seam" against the toes/foot. The fibers should wear evenly, instead of leaving thin spots where friction can occur and offer moisture-wicking properties to minimize the risk of infection and blisters. 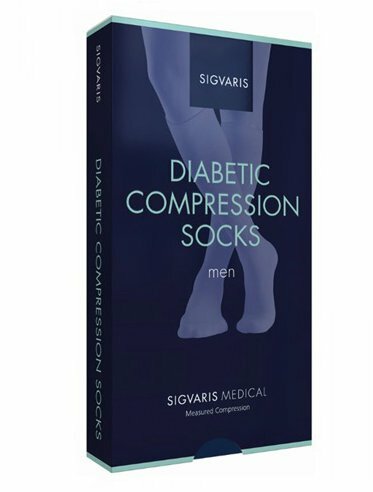 Available in North America, SIGVARIS Diabetic Compression Socks offer all these same features, plus the benefit of 18-25mmHg graduated compression. They are designed with the diabetic patient in mind. 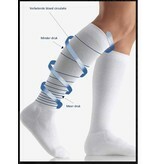 This soft padded sock is made with DriRelease® yarns with FreshGuard® to wick away moisture and provide odor control. Extra attention has been made to provide a flat interio seam on the toe guard, as well as a more comfortable top band. 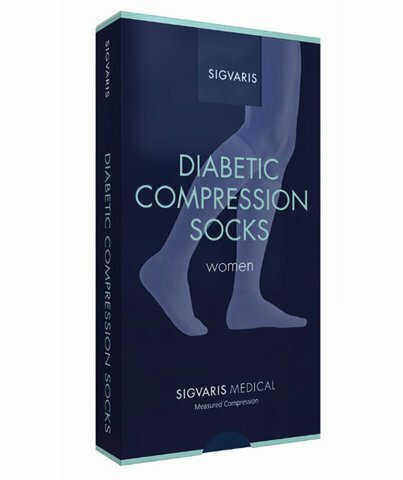 Unlike some diabetic socks, which are measured by shoe size only, SIGVARIS socks provide a custom-like fit by measuring your ankle, calf and lower leg length to determine your size. Look at this difference as "medicine for your legs"!